Seattle Opera Blog: To Boo the Bad Guy, or Not? To Boo the Bad Guy, or Not? Stefano Secco as Pinkerton in Madama Butterfly. I don’t hate Pinkerton. I think a lot of people can identify with him because he’s just a young guy who is basically ignorant to the world. So I don’t think he’s a bad guy. If he’s a jerk all the time, why would [Cio-Cio-San] have fallen so deeply in love with him? Pinkerton, I’m sorry to say, is a very, very bad guy! I think he will reflect a great deal on what has happened. He is ashamed: "It’s my fault, it’s my fault." So maybe some things will be better with his new wife and son. But the tragedy is extremely strong. At the end of the first act, the audience loves Pinkerton. At the end [of the opera], they HATE Pinkerton. "Boo!" Secco’s not wrong. Many of our audience members have become so emotionally invested in Madama Butterfly that they've enjoyed booing Pinkerton at the final curtain call, an occurrence that Secco believes is quite an honor. When I hear booing, I know I've accomplished my goal! @SeattleOpera I thought it was fab he was booed at the end :)BTW, it was a fabulous, fabulous production. Kudos to all. The great thing about art is that there's rarely ever a "right" or "wrong" answer. We'd love to hear from more of you, whether you've attended this particular Butterfly or not. Is it acceptable for audiences to boo the character during a singer's curtain call, even if (or because!) their performance was great? Is it a sign of appreciation for a job well done, or is it disrespectful? Why do we boo Pinkerton, but not Don Giovanni or the Duke of Mantua? Which operatic villain do you find the most realistic? Is booing the bad guy at an opera a strictly American phenomenon? Feel free to comment here on the blog, over on Facebook, or send us a tweet! appraise the musicians not the characters of the plot. 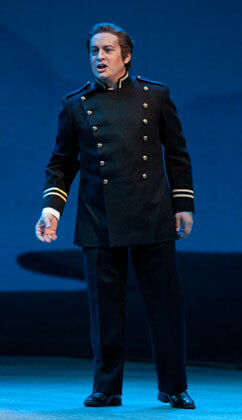 If we boo Pinkerton-the-bad guy, then for consistency we should start booing all the other villains in Opera. Scarpia, Conte di Luna, Iago, the Queen of the Night, Turandot (since she's so cruel for most of the opera), father Germont (I don't like him - he ruined a wonderful love story), Lulu, Mephistopheles, Don Giovanni, Don Jose (remember, he kills Carmen - don't we care?). Since when was Opera about cheering the good girl and booing the bad guy? I always thought it was, first of all, about applauding the amazing voices & the great music. I attended last night's Butterfly and waited to see what would happen when Secco took his bow. I was cringing in anticipation of what I have been reading. But at least last night I found that there was only a bit of booing mixed in with mostly applause. I found it complimentary, as Secco himself says. I found it to be playful audience participation. And to be honest I have heard it before with a much loved Seattle singer, Greer Grimsley. I forget what role he was in but he smiled through it all understanding the humor; and again it was mixed with enthusiastic applause. I think because Secco is a foreigner and new to Seattle it comes across as rude. And again it was very subdued last night.